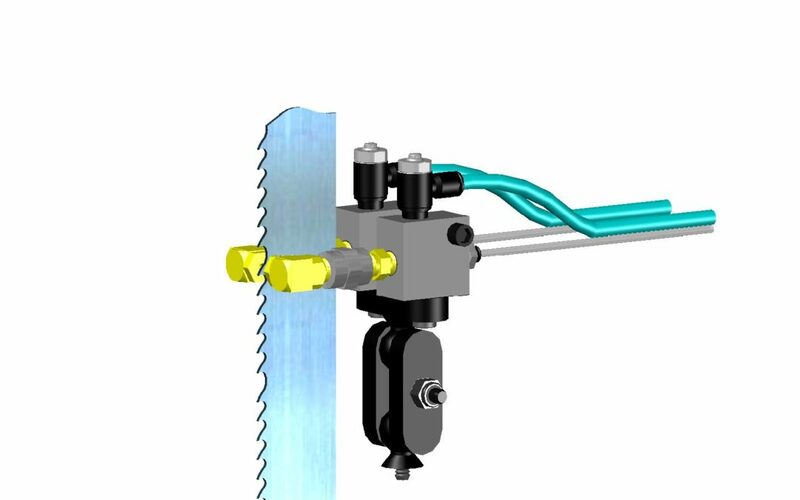 CANMIST High Performance Precision Lubrication Systems improve weldability of sawed steel bars. A manufacturer of structural supports for highway construction recently came to AMCOL with a problem. While bandsawing bundles of steel bars, a tacky residue of flood coolant would cause the saw chips to stick to the ends which required a manual brush cleaning. Some chips would still remain after cleaning, causing defects in the welding process. AMCOL recommended the 6000 Series Lubrication System with Bandsaw Nozzle Assembly and 344 CANMIST High Performance Lubricant concentrate. After installing the system, the dry chips were easily and thoroughly removed, improving weldability of the cut bars and quality of the final product. As an additional benefit, the customer reported that, with no flood coolant on the floor, the saw operators were pleased they no longer had to stand in a pooled coolant mess.